Salalah is the capital of the Dhofar and with almost 200000 inhabitants the second largest city in Oman. Salalah prospered in the past due to the commerce of frankincense, whose trees grow and are harvested in the Dhofar. The oldest part of Salalah is Al Balid, a harbour from which the frankincense was exported. Its ruins today are part of the Al-Baleed archaeological park, a UNESCO world heritage site. 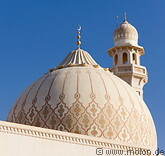 Salalah is a relatively small city with few other sights, of which one is the new Sultan Qaboos mosque, completed in 2009. The main attraction of Salalah is its beautiful coconut palm tree-lined white coral send beach, which stretches for tens of km east and west of Salalah. Tropical fruits, such as bananas, papaya and coconuts are grown in fields near Salalah. The city has its own international airport.